A week or two ago my Daughter Katie and I went a rummaging,despite leaving the Vintage business almost three years ago,I am on occasion persuaded to peruse the odd fair or second hand shop,it is a bittersweet experience for me,infact my heart is still a little bit broken for a life left behind,however,Onwards and upwards. So….there we were wandering around one of our old haunts,not much took my fancy,but then amongst a pile of old papers, I discovered a rather wonderful little book! And given my interests in spiritual life,it did seem quite marvellous that for a brief moment my two worlds collided! Synchronicity! I live for it I tell you! 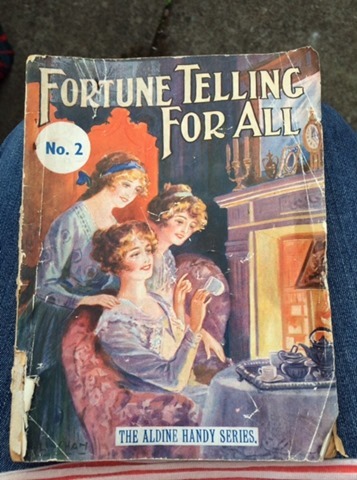 I date this little beauty to around 1930,it is fascinating and odd in equal measures,to be fair it probably scared the bejaysus out of folks at that time,some of the chapters are fairly innocuous,such as ‘How to read the cups’ or ‘fortune telling with cards’ a lot of it is very interesting,the art of divination is as old as the hills,but then we find some other means of ‘fortune telling’ like ‘moles and their meanings’ we learn that a woman with a mole on the left side of her mouth,will develop philanthropic tendancies and in all probability,will die an old maid.Oh dear. Equally terrifying is ‘your fate by dominoes’ seemingly if you draw double blank,you can look forward to misfortune in love,loss of property or money through fraud.Not good. a chapter on everyday signs and warnings seemed promising,I love a good sign…..well maybe not if it is ‘an itching of the left shoulder’ which apparently foretells that I will soon have a heavy burdon of sorrow to carry.And here is one which could just tip my OCD over the edge,If on first leaving your house on a morning,you turn back after you have crossed the threshold,you must do so three times,or you will be unlucky for the remainder of the day! But it’s not all bad,for all you Gals out there looking for love,here is a Midsummer Eve charm to attract a lover. Hempseed I sow,Hempseed I hoe,let him that is my true love,come after me and mow. She will meet her mate within three days of the sowing. Next Article Summer so far……..